Our second straight review that gives us a new artist to contemplate and in Freddie Mitchell another sax refugee from the jazz field looking to keep their career afloat by aligning themselves with rock ‘n’ roll, providing further evidence as to the upstart music’s growing clout. But as we’ve seen so many times before it’s one thing to acquiesce into making this music at the whims of a record label or a booking agent imploring you to aim for a more modernly commercial sound to keep getting you gigs and another thing altogether to gravitate towards it willingly and enthusiastically. Mitchell seems to have the enthusiastic part down, but is it just a case of substituting energy for inspiration, or would he, like Joe Thomas before this, manage to transcend the somewhat crass attempt at career revivalism and come away with something entirely legitimate in the bigger picture of rock? This record not only marks the debut of Freddie Mitchell on these pages but also the very first release of the Derby Records label, another small independent company looking to capitalize on the growing rock movement afoot. What’s interesting of course is the sheer number of record companies that were springing up in the late 1940’s and rather than even attempt to compete with the established major labels (RCA, Decca, Columbia and Capitol) with light pop fare designed for mainstream white consumption, the majority of these start-up firms were instead aiming at the relatively small market that comprised black America at the time. Even more specifically they were honing in on just a subsection of THAT demographic which comprised the rapidly expanding rock audience, an entirely separate entity from the more established blues, jazz, gospel and pop fields that had long been the primary outlets for black musical expression on record. That speaks highly of the depth of interest that existed within the black community for music designed for its own consumption, untainted by a pre-existing mindset which determined what styles were worth the effort. For what – at the time – could only be said to make up perhaps 2% of America at best (IE. the rock listener within the larger black populace which comprised roughly ten percent of the total population), the rock fan proved the ability of any determined statistical minority to take control of the narrative of a wider public issue by simply making it an all consuming passion. Though vastly outnumbered in the broader consumer arena and with only a small fraction of the disposable income to spend on music relative to white America, the intensity with which these fans – anonymous, never celebrated, barely recognized historically – gave themselves over to the music is what created the sustainable market which would soon virtually overthrow the accepted order of things. Derby Records was merely symptomatic of that, one of many labels to spring up because of the expanding commercial opportunities, and in actuality they didn’t stick to rock ‘n’ roll exclusively at any point during their six year run. But rock music was omnipresent in their approach due to their initial signee, the artist featured here today, one Freddie Mitchell. Not only was Mitchell the first act signed as an artist but he was also given the task of overseeing the entire musical roster at the company’s bandleader and music director. That Mitchell was black and this was 1949 that latter designation is an important one socially for sure, but it’s doubtful Derby was thinking in those terms at all, other than maybe just having to momentarily consider the implications before pressing on, because the REAL drawing power for naming Mitchell to such a post was that he was somebody who had the experience to reasonably handle such a task. Freddie Mitchell was a saxophonist who’d been lurking around jazz for most of the 1940’s without ever quite becoming a recognizable name to the public like perhaps Joe Thomas had been with Jimmie Lunceford’s group. Mitchell though had paid his dues by recording briefly with a handful of acclaimed artists such as Benny Carter, Fletcher Henderson, Hot Lips Page and Louis Armstrong, but it was with the comparatively minor figure Ovie Alston whom he’d joined in the mid-1940’s after those short stints with bigger names that he lasted longest. That could be why he never made the leap to the level of name recognition that others who had the good fortune to play for years in more widely known bands were able to do. If Alston himself couldn’t become a star as the headliner, how could a supporting saxophonist merely playing behind him be expected to do so? But in a way that might’ve been a good thing for his prospects in rock, for once you became established as a jazz kingpin associated with a big name leader your fate would forever be tied to that realm. By contrast Mitchell was seen more as somebody whose skill was largely untapped and without the long list of plaudits to his name in jazz might be more likely to accept such a challenge as leading a house band playing a different style for a brand new label. What remained to be seen was just what type of band would come out of this, jazz based for sure, that was his background and where he had the most connections to draw from when assembling the group, but would they be inclined to resist pursuing something a little seedier when called upon as we’ve seen too often with others from time to time, or would they give themselves over to the current trends and dive into the bawdy sax instrumentals that were shaping rock ‘n’ roll more and more each time out? Right off you wonder how the circumstances of an initial recording session on a new label affected the output, particularly since we’re talking about instrumentals, something that at least had the possibility of coming out of a looser jam session feeling around for ideas as opposed to being written out by one or two people who then worked out the arrangement and taught it to the band, going through it enough to work out the kinks. That might’ve been what happened anyway, but I get the sense with not just Mitchell’s debut on Slider but on LOTS of instrumentals by many different artists that the approach was more along the lines of “make it up as we go along”. Not improvisation as much as a case of musicians talking over what riff or progression they remembered from somewhere else, then playing around with it and handing out parts on the fly before finally writing down the changes and taking it from there. Certainly Slider has that loose-knit feel that calls to mind just such a scenario as it starts off with a typical jazz-rooted intro, a rather unambitious, almost dull repeating refrain that sounds like a thousand and one other anonymous bandstand pieces. In fact I’m not so sure we HAVEN’T heard it before around here, almost quite literally with just a few minor modifications. Since instrumentals are by their nature harder to specifically recall by virtue of having no lyrical touchstones, it’s more of a sense of déjà vu but looking back we find that the intro is remarkably similar to Hal Singer’s Beef Stew, except played slower and more deliberately, so I’m just guessing that the riff was a common starting point in a lot of jams that were passed around like mononucleosis at a Valentine’s Day dance in Junior High. The problem though isn’t its appropriation from somewhere else but rather its underwhelming nature for introducing us to Freddie Mitchell. We don’t want something tame and warmed over, we want someone who explodes out of the gate with a sound or an approach that’s entirely new, or if not new at least taking existing standards of the instruments to the extreme. But for now we have to deal with it in a way that dampens our enthusiasm and causes us to think that Freddie Mitchell, along with Derby Records, are merely half-hearted in their attempts to sway us into throwing in with them as legitimate rock peddlers on the already crowded market. We’ve learned by now however not to merely judge an entire record by the first fifteen or twenty seconds, or even the first minute for that matter, as our last review for Joe Thomas’s Backstage At The Apollo proved as he increasingly stepped up and delivered something quite remarkable out of an even more desultory intro than Mitchel and company exhibit on Slider. Sure enough this picks up as well though it takes its sweet time doing so, not until 45 seconds in do we get anything BUT that boring monotonous riff. Yet while the change in tempo and tone is certainly welcome, it’s not exactly elevating this much in terms of excitement. The musicians seem woefully out of step with one another, as if one group of them were off to the side noodling around on their own while the lead worked out his part in another room. Discordance may not always be a sure-fire record-killer but it takes some pretty impressive chops from all involved to overcome such a man-made obstacle and so far they don’t have what it takes. The ray of sunshine peeking through the ominous clouds finally comes sometime in late afternoon so to speak, long after you’ve given up on getting outside for the day. In this case Mitchell’s showcase solo kicks in a minute and a half into the proceedings, but while he’s playing with something resembling rock grit and urgency it veers too much towards noisy bellowing rather than anything rousingly edgy and exciting. It doesn’t help that the other horns are drunkenly swaying to and fro, keeping the record sounding as if it were a radio tuned to two different stations, neither of which would be on the air for long if this kept up since neither riff has hit written on it, even in small print on the underside of the package. When the original more modest refrain returns you actually breathe a sigh of relief, not that it’s any better than it was the first time around but rather because it’s less grating on your eardrums. Throughout all of this mess there’s hardly any contributions from the other musicians, save a few thumps by the drummer who otherwise merely rides the cymbals as lightly and unobtrusively as possible. The piano is but a distant whisper over the hills and nothing else breaks through the fog enough to be noticed. It all concludes, rather jarringly, with a vocal shout of some kind, though its precise language and meaning aren’t quite clear. I’ll assume they meant it as an emphatic closing to a rowdy performance but by this point there’s nobody left in the club, or probably in the control room for that matter, to give a damn. Your instinct might be to cut them a little slack as this was an initial effort before they got their feet under them, but these weren’t wet-behind-the-ears inexperienced novices still in their teens who’d never seen the inside of a recording studio before, they were all veteran musicians with years of playing behind some demanding bandleaders. While it’s true that those bands weren’t called upon to play something as musically simple as rock ‘n’ roll perhaps, they likely would’ve done so more credibly than is shown here, simply because you can assume the likes of Benny Carter or Fletcher Henderson would’ve at least required their charges to stay in tune throughout whatever they put to wax. Here there’s no such standards that are adhered to and as a result this sounds less like professional musicians stepping uncomfortably outside their preferred field and more like wayward amateurs stumbling around the dark. 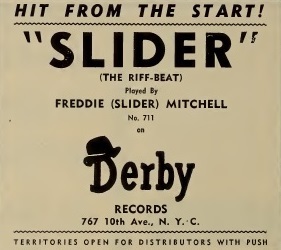 If Slider had failed because it aimed too high, sticking closely to a jazzy arrangement with the wrong instruments emphasized than anything that was typically welcome in rock ‘n’ roll that’d be one thing. Not forgivable in the score we hand out, but at least more understandable in the human sense of being asked to try things which were well outside your comfort zone. This on the other hand seems to accept the basic premise of rock and picks the right horns from the tool box to work up something reasonably qualified, yet it’s their playing itself even more than the arrangement which lets it down. By listening to this you’d never suspect these guys had been even taking lessons for more than a year, let alone were seasoned professionals who were now being employed to provide the musical backing for an entire roster for a brand new record company that presumably had its sights on lasting more than a few weeks in business. Based on the desultory Slider the fact that Freddie Mitchell doesn’t wind up just becoming a one-off presence on these pages might be one of more surprising results we’ll have to offer over the years here… and that he’ll score actual hits in the future and become a respected rock musician for a decade is more amazing still. As first steps go however this could hardly be much worse unless in taking that step Mitchell tripped over his own shoelaces and tumbled down a staircase, breaking his leg in the process. 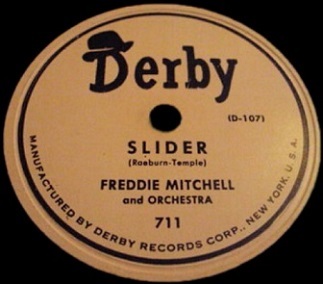 Leave a reply on "Freddie Mitchell: “Slider”"